The discovery of a complex microbial ecosystem far beneath the Antarctic ice may be exciting, but it doesn't necessarily mean that life teems on frigid worlds throughout the solar system, researchers caution. "The team has opened a tantalizing window on microbial communities in the bed of the West Antarctic Ice Sheet, and on how they are maintained and self-organize," Tranter wrote in an accompanying "News and Views" piece in the same issue of Nature. "The authors' findings even beg the question of whether microbes could eat rock beneath ice sheets on extraterrestrial bodies such as Mars. This idea has more traction now." But just how much traction is a matter of debate. For example, astrobiologist Chris McKay of NASA's Ames Research Center in California doesn't see much application to Mars or any other alien world. "First, it is clear that the water sampled is from a system that is flowing through ice and out to the ocean," said McKay, who also was not part of the study team. "Second, and related to this, the results are not indicative of an ecosystem that is growing in a dark, nutrient-limited system," McKay told Space.com via email. "They are consistent with debris from the overlying ice — known to contain micro-organisms — flowing through and out to the ocean. Interesting in its own right, but not a model for an isolated ice-covered ecosystem." 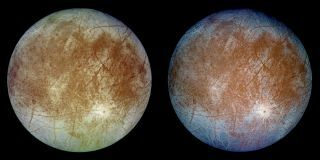 Isolated, ice-covered oceans exist on some moons of the outer solar system, such as Jupiter's moon Europa and the Saturn satellite Enceladus — perhaps the two best bets to host life beyond Earth. McKay and other astrobiologists would love to know if these oceans do indeed host life.